A trans-disciplinary research team, led by Alexander Klippel, professor of geography and Gosnell Senior Faculty Scholar, received one of 10 seed grants to pilot programs that support Penn State’s 2016–2020 Strategic Plan. “Immersive virtual technology has developed in lightning speed in the past five years, partly due to advances in understanding the important spatial visual features in the environment and the industry’s ability to implement this understanding into their technology,” said Ping Li, professor of psychology, linguistics, & information sciences & technology, co-director, Center for Brain, Behavior, and Cognition, and associate director, Institute for CyberScience. 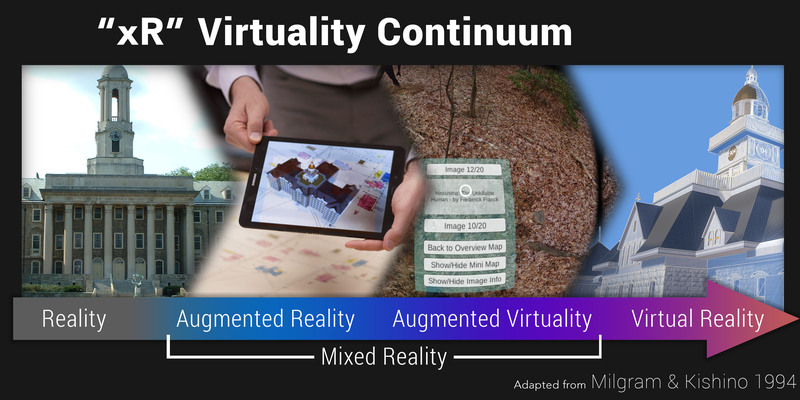 Some of the pilot project goals include creating a prototype immersive virtual reality theatre; developing a repository of knowledge on immersive technologies; investigating and disseminating research-based best practices for using xR in research, education, and service. “I think this project will help the University see the potential of this technology and will indeed change every aspect of academic life from teaching to service to outreach,” Klippel said. “As a seed grant, it is meant to bring people together with the goal to write bigger and bigger grants, and that is already happening. There are a lot of funding opportunities. What is the future of immersive technologies or “xR”? Keller and Li said they anticipate combining it with big data to transform teaching, learning, research, and decisionmaking. More information about all the funded proposals and their authors is available at http://strategicplan.psu.edu/funded-initiatives.